Walnut wood surface and unsurpassable hair tip fit comfortably in hands, fingers, and face edges. Natural curve and same finished size offers a dignified design while using or while stored. Bring nature closer with walnut oil finished wood and relish the improved performance with each use. Make time for deep and graceful moments. Designed for essential beauty and the embrace of new unique brush techniques with environmental consideration. 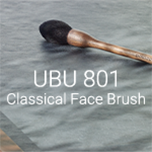 Not in keeping with common place, through trial and error, we made the integrated brush handle without a ferrule. Hair tip of velvety smoothness is finished and made by experienced craftspeople’s careful hand. The technique and agelong discernment done by only experienced hands is evident in the brushes. “Core belief” inherited through 180 years of Kumano brush making seeking new uniqueness.